Hope you don't mind a brief discussion of the book-publishing industry. I know this a cinema blog, but in my opinion books tend to be slightly less of a disgraceful waste of time and mammoth human resources than movies. Anyway, a recent pop-fiction phenom has been an imprint called Quirk, who hit big with the Jane Austen horror "mashups" Pride and Prejudice and Zombies and Sense and Sensibility and Sea Monsters. Oh, and their Abraham Lincoln, Vampire Hunter was popular enough to be turned into a 2012 movie that nobody, apparently, likes. Too bad, I actually found the book diverting, even if the undead gimmick didn't carry sufficiently to the end. Anyway, it's clear that Quirk's money-making endeavors are, at this point, aimed for what the corporate types like to call cross-media exploitation, conceived with a view to movie adaptations and action figures and probably theme parks by now, built on the launch-platform of formula mashup books. It was impossible not to notice Quirk star author Seth Grahame-Smith as one of the screenwriters of the 2012 bigscreen reboot of DARK SHADOWS (which was also widely disliked). So with such a spotty record of literary achievement, literary purists can take note that at least one Quirk property will never see the light of projection bulbs. Android Karenina, a science-fiction spoof of Leo Tolstoy's 1873 novel Anna Karenina, was a crashing disappointment by Quirk standards. Even so, it probably still outsells all my own books combined. So the fear of a revisionist version of Anna Karenina (previously filmed by Hollywood in 1935 with Greta Garbo and 1948 with Vivian Leigh) at least rules out robots and cyborgs. As far as the other gimmick dropped on you by filmmaker Joe Wright (ATONEMENT) with the big, new ANNA KARENINA of 2012, well, it's okay, I guess. But like the vampires in that Mr. Grahame-Smith's Abe Lincoln mashup, it doesn't quite last out the running time. 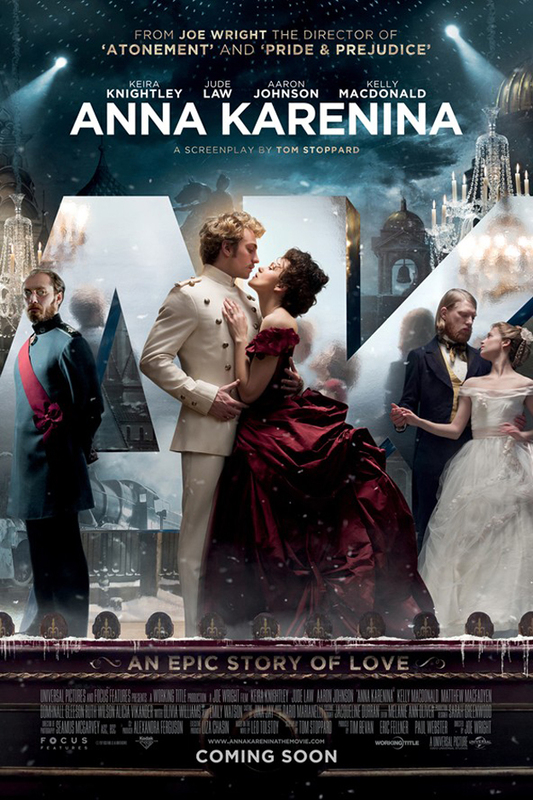 Utilizing high-tech f/x and transitions, this ANNA KARENINA is put across as the twice-told tragedy rendered as a stage show - an impossible stage-show performance, unwitnessable by any but a movie audience, in which the "fourth wall" is routinely broken. While set transitions take place, and painted (or CGI, maybe) backdrops and cycloramas rise and fall and shift, the camera also goes into room after room, out of doors, and into illogical spaces. The notorious locomotive that foreshadows the book's famous suicide climax atone point becomes a very obvious toy train. Yet, all this in a spectacle that was clearly rendered on a sumptuous and expensive scale (albeit nothing like the largesse expended on DR. ZHIVAGO back in the day). 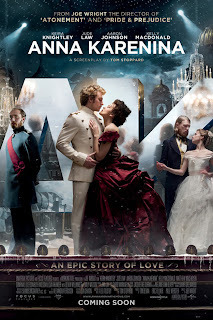 The plot concerns, of course, Anna Karenina (Keira Knightley, a regular in Wright's pictures), wife of a much-admired but passionless government functionary Alexei (Jude Law, rather cast against type and styled like a grim clergyman), who falls into an adulterous affair with the fiery aristocratic Czarist cavalry officer Vronski (Aaron Taylor-Johnson), ultimately becoming pregnant by Vronski. Alexei refuses to give Anna a divorce, and her attempts to cohabit with Vronski result in her rejection by upper-crust society (pretty quaint detail that; today Anna would get a "real housewives" reality show, and ultimately dump Vronski for Kelsey Grammer or someone), leading to the tragic denouement. A parallel plotline, possibly inserted by Tolstoy just to reassure one or two people out there that marriage can be good (maybe that's why Android Karenina didn't work; book was science-fiction already), we see a conscience-stricken young aristo named Constantine in a shaky courtship with another Vronski-smitten lass, the delicate Kitty, and discovering that as a mate she is far more broadminded and progressive than he had imagined. more than it would be to expect Swan Lake to realistically depict the habitsof waterfowl. Both are great to look at, though, and Mr. Wright's film can be taken simply as object d'art alone.